Owners/operators must register all USTs with the Virginia Department of Environmental Quality (DEQ) by submitting a completed Notification for Underground Storage Tanks form (instructions for filling out this form can be found here) to the appropriate DEQ regional office. Owners/operators must report any suspected or confirmed releases to the appropriate DEQ regional office (click here for the interactive map) within 24 hours of discovery. 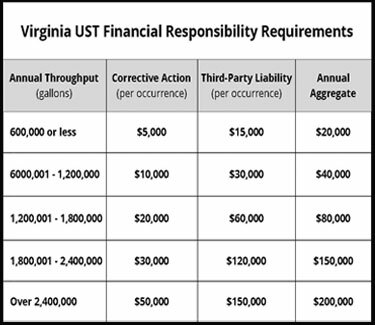 Virginia bases its required coverage amounts on annual throughput in gallons for the previous calendar year, as illustrated in the table shown here. The per-occurrence amount is broken down into corrective action amounts (to cover clean-up activities) and third-party liability amounts (to cover the costs of third-party lawsuits for bodily injury or property damage caused by a petroleum release). The annual aggregate amount is the total amount of financial responsibility an owner/operator must demonstrate to cover leaks which may occur within one year. Owners/operators may use any of the following mechanisms to demonstrate financial responsibility. Each DEQ regional office will conduct periodic inspections of each UST system in its area. If a DEQ inspector determines that a UST or UST system is out of compliance with UST regulations, he or she will first issue a notice of alleged violation with a time frame in which the owner/operator must correct the alleged violations. If the owner/operator does not address the alleged violations within that time frame, the DEQ regional office will provide written notice to the owner/operator of an informal fact-finding hearing to determine whether a UST system is eligible for delivery prohibition. The fact-finding hearing will be scheduled as soon as practicable but at least within 10 business days. If the DEQ determines that the UST system is out of compliance, an inspector will affix a red delivery prohibition tag to the fill port of the non-compliant UST system. Prior to permanently closing a UST, the owner/operator must ensure that he or she has obtained a permit and the required inspections from the building official in accordance with the provisions of the Virginia Uniform Statewide Building Code. At least 30 days prior to permanently closing a UST, the owner/operator must notify the DEQ of the intent to close the UST. The owner/operator must also initiate and complete a site assessment by measuring for a release where contamination is most likely to be present. If contaminated soils, contaminated groundwater, or free product as liquid or vapor is discovered during the site assessment, the owner/operator must immediately begin corrective action.